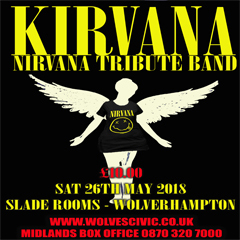 The UK's best Nirvana tribute, Kirvana are back to rock Wolverhampton once more! Kirvana has been formulated on love, admiration and living for the recreation of the most inspirational bands of this generation. Kirvana have spent time, effort, blood, sweat and tears to perfect the wall of sound. Although Kurt portrayed the hatred for covers and 'pretending to be someone else' Nirvana covered 36 songs and often quoted such greats as Neil Young in their short career, this has given Kirvana permission to bring forward the loving tribute as Kurt, Dave and Krist did over the years. With this in mind, Kirvana wanted to keep the dream alive, bringing back the wonderful era of the 90s. Join them for 20/20, Thunder Bird, Park Lanes and the perfect recreation of the most immense sound of our generation. Ladies and gentlemen, welcome to Kirvana.